Surprisingly for a city split between two continents, Istanbul existed without connecting bridges for most of its existence. After the construction of the Bosphorus Bridge in the 1970s, the second unifying bridge, Fatih Sultan Mehmet, came in 1988. It is part of Istanbul’s O-2 highway and connects the European and Asian sides of the city. Connecting the neighborhoods of Hisarustu and Kavacik, near the Rumeli Hisari and Anadolu Hisari fortresses, the gravity-anchored suspension Fatih Sultan Mehmet Bridge spans one of the narrowest sections of the Bosphorus Strait. It is not open to pedestrians. Small-group and private tours often cross the Fatih Sultan Mehmet Bridge, and Bosphorus cruises pass underneath it. Many tours that include the bridge often also visit Dolmabahce Palace, Rumeli Fortress, the Blue Mosque, and other major Istanbul attractions. The Fatih Sultan Mehmet Bridge is a toll bridge for vehicles traveling from Europe to Asia. There is often rush-hour traffic on the bridge, so plan your trips accordingly. The bridge is named after Sultan Mehmed the Conqueror, who took control of Constantinople from the Byzantine Empire in 1453. The Fatih Sultan Mehmet Bridge is easily accessed by car from any major highway in Istanbul. You can also pass under the bridge on a Bosphorus cruise. Traffic can get slow on the bridge during the morning and afternoon rush hours; in the early morning and late at night, traffic on the bridge is minimal. 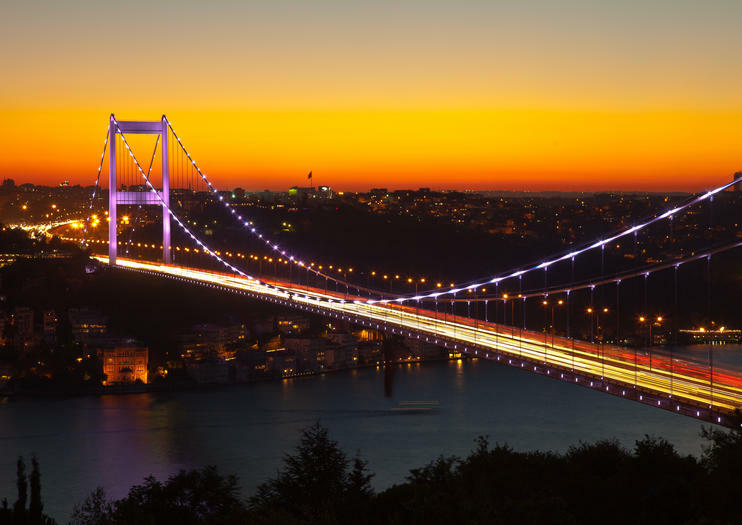 At night, the Fatih Sultan Mehmet Bridge is illuminated with colorful lights, which makes it an excellent time to admire it on a Bosphorus cruise. The first bridge to span the Bosphorus Strait was constructed in 1973. Originally named the Bosphorus Bridge, its name was officially changed in 2016 to the 15 July Martyrs’ Bridge. Also in 2016, Istanbul’s third bridge, the Yavuz Sultan Selim, located in the far northern section of the Bosphorus Strait, was opened to the public. See the glittering lights along the Bosphorus Strait on a 3-hour cruise with dinner and a cultural show in Istanbul. Kick off the night with a welcome cocktail on deck, and enjoy panoramic views of the city skyline. Relax over Turkish appetizers and grilled entrees as belly dancers and folk dancers take the stage to the haunting sounds of traditional music. Sip a cup of Turkish coffee or a drink from the open bar, listen to music from a live DJ and soak up stunning nighttime views of Istanbul. Experience the magic of Istanbul at twilight on this 4-hour cruise along the Bosphorus, enjoying views of both the European and Asian sides. Tuck into a generous buffet dinner of local cuisine as you float past illuminated landmarks like Dolmabahce Palace, the Bosphorus Bridge and Beylerbeyi Palace, and watch as the bars and nightclubs along the waterfront transform the city into a sea of neon. Instead of driving around Istanbul all day in a stuffy tour bus, discover the city’s beauty in style on this relaxing sunset cruise down the Bosphorus, the waterway that marks the border between Asian Turkey and European Turkey. From the open-air deck of your luxury yacht, see riverside landmarks like the Dolmabahçe Palace, the Ortaköy Mosque and the Rumeli Fortress, all lit by the beautiful dusk light. Ensure your spot on a Bosphorus River dinner cruise for a memorable night out in Istanbul. The dinner cruise includes a 4-course meal of Turkish fare, and live entertainment that features traditional music and belly dancers. Soak in the sights of the city at night during your cruise on a tour that includes the convenience of hotel pickup and drop-off. Float past the glittering city lights and enjoy views of Istanbul’s European and Asian side, on an atmospheric 4-hour dinner cruise along the Bosphorus. Feast on a 3-course dinner, acompanied by unlimited local alcohol, as you glide past Dolmabahce palace, the Blue Mosque, Faith Sultan Mehmet Bridge and the Maiden Tower. Then enjoy the on-board entertainment, including belly dancing and Turkish folk dancing performances. Enjoy a night on the Bosphorus Strait filled with belly dancing and Anatolian folk music during this 3.5-hour dinner cruise from Istanbul. This Bosphorus dinner cruise traverses over the strait’s beautiful evening waters and passes Istanbul’s best sights. See the illuminated Fatih Sultan Mehmet Bridge and Blue Mosque as you watch a traditional performance and savor great food and drinks. There are a lot of Bosphorus cruise packages available, but it’s hard to find ones that are as suitable for 4-year-olds as they are for 40-year-olds. This all-ages dinner cruise, with discounted tickets for under-8s, fits the bill. Savor your river views of the lights of Istanbul burning in the darkness, stack your dinner plate with fresh seafood and delectable Turkish cuisine, and enjoy the thrills and colors of a cultural show with sword dances, whirling dervishes and much more. Cruise between 2 continents as you dine on Turkish meze on a 3-hour Bosphorus cruise of Istanbul. Marvel at monuments from the Byzantine and Ottoman empires, and enjoy a full program of entertainment, such as folk and belly dancing.Climb aboard a pleasure boat for a luxurious cruise along the Bosphorus Strait, while dining from a 3-course menu of Turkish meze and local drinks. Sail past some of Istanbul's greatest monuments, while watching traditional entertainment along the way.Following a pick-up from your hotel, transfer to the yacht for the start of your journey. Get a welcome cocktail on deck as you begin to sail as far as the Black Sea. Cruise between Europe and Asia, passing under the Bosphorus Bridge and Fatih Sultan Mehmed Bridge.As you feast on a meal of typical meze dishes and mains, watch live folk dances from different regions of Turkey. Be seduced by the sensual moves of a belly dancer, and relax to international music by the on-board DJ. Watch the Istanbul shoreline light up after dark on a Bosphorus dinner cruise that includes round-trip hotel transfer, dinner, an open-bar, dancing on deck, and an evening program of traditional music and dance. See the city’s palaces, bridges, and fortifications from the water, and enjoy Istanbul at its most romantic. Visit the Dolmabahçe Palace and enjoy a Bosphorus cruise on this private Istanbul tour. Explore the Dolmabahçe, the last, lavish palace of the Ottoman sultans, and the Rüstem Pasha mosque. Then, enjoy an afternoon Bosphorus cruise, passing the Rumeli and Anatolian fortresses, Bosphorus Bridge and Topkapi Palace before finishing with time at the Spice Market. A flexible itinerary, choice of departure times, and central hotel pickup and drop-off included. Glimpse over the serene waters of the Bosphorus Strait and admire architectural highlights on this private 1-hour romantic sunset cruise. Enjoy the intriguing views of Dolmabahçe Palace and Rumeli Fortress as you sip a glass of wine (included) and sail beneath Fatih Mehmet and Bosphorus bridges. This enchanting evening on the water that separates Europe and Asia is the best way to see elegant mosques, mansions and Ottoman villas that illuminate at dusk and speckle both coastlines. Enjoy a private 7-hour shopping tour that includes lunch at a restaurant overlooking the Bosphorous River. Spend the morning at premier shopping destinations including Istanbul Cevahir mall and İstinye Park. After lunch, go sightseeing at locations made famous in two popular Turkish TV series: Aski Memnu and Binbir Gece. Enjoy the comfort of private climate-controlled car with a professional driver-guide. See the Fatih Sultan Mehmed Bridge and Bosphorous Bridge as you return across the Bosphorous at the end of your tour. You will have a chance to see Istanbul from the Bosphorus is an impressive and unforgettable cruising experience. With the yacht to yourself, you’ll soak up the atmosphere of this famous riviera, gliding by some of the best Bosphorus sights along both Asian and European shores from waterfront palaces of Sultans and their Pasha’s villas. Relax and enjoy close-up views including the European Side, Dolmabahçe Palace, Çirağan Palace, Rumeli Fortress, the Bosphorus Bridge, Asian Side and more.